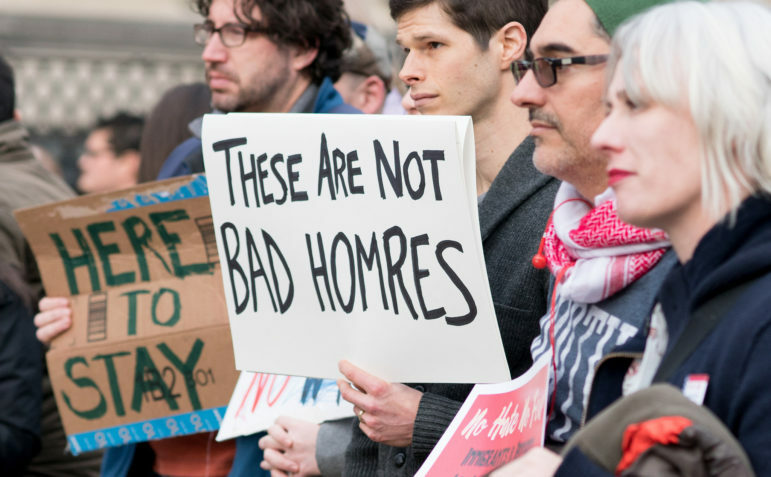 An immigration rally at the White House in February 2017. Even when children receive the reference list, the court expects them to contact the organizations on their own, regardless of their age, ability or language of origin — a particular challenge for speakers of indigenous languages — says NYLAG attorney Crystal Fleming. In theory, the government has a responsibility to ensure each defendant understands the court proceedings and their responsibilities, but the presence of a court-appointed translator usually suffices to fulfill that responsibility, Fleming says. 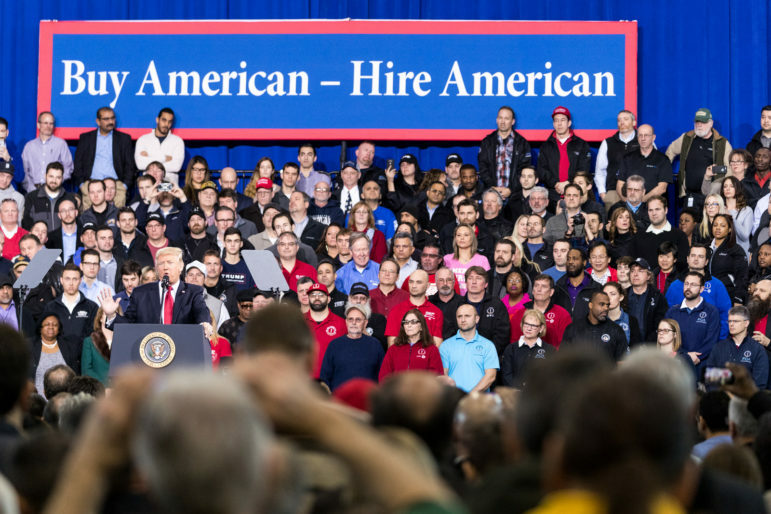 President Donald Trump delivers remarks on Wednesday, March 15, 2017, at the American Center for Mobility in Ypsilanti, Michigan. The translator’s diligence and the defendant’s comprehension can vary by case, however. For example, at a proceeding late last year for a Chinese immigrant with mental illness who stuttered his responses and rocked forward and backward in a self-soothing manner, a translator conveyed only a tiny fraction of the statements made by the judge, the government’s attorney and the client’s own attorney. While the lawyers interviewed by City Limits used various synonyms for disorder to describe the present state of affairs — what Stotland referred to as “mishegas” — a lack of transparency has forced attorneys to speculate about the changes. Krause from Legal Aid says limited communication from the court has left the attorneys unsure about why the changes have occurred and why they have been prevented from using empty spaces in other parts of the building to meet with children. Krause says the changes may have occurred due to general “chaos” since the Trump administration took over and that Assistant Chief Immigration Judge F. James Loprest may have his hands tied by his superiors. Loprest has not scheduled a formal meeting with organizations and rarely responds to correspondence, Ziesemer, Benson and Krause say. The court told City Limits and the legal organizations that they took away the screening rooms because they plan to construct more courtrooms and bring on more judges. “We are continuing to seek ways to accommodate attorneys who wish to meet with clients at the immigration court,” Martin told City Limits in an email. For adults, the courthouse experience serves as a test of endurance in the grim face of bureaucracy, a challenge further complicated by fear. For children, it can be a confusing nightmare. 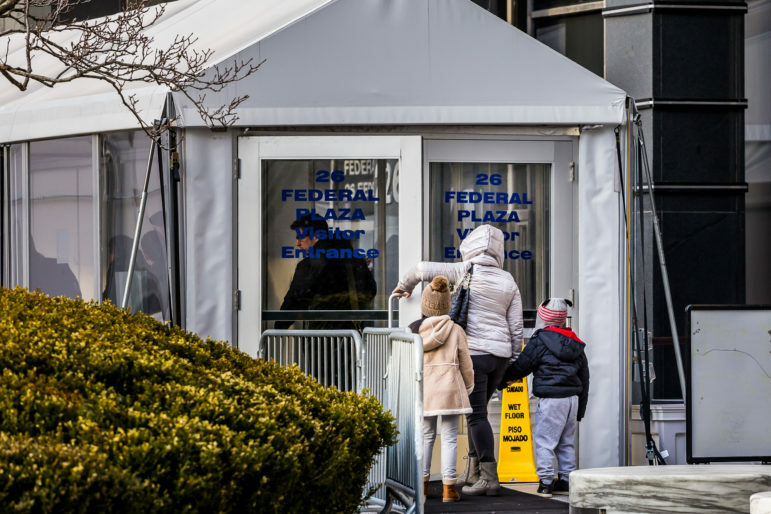 After arriving at 26 Federal Plaza, a few blocks north of City Hall, an individual who visits the court must first wait on line outside, where security personnel look through bags. Next, the individual passes through airport-style security, stripping shoes and belts, emptying pockets and walking through a metal detector while agents shout instructions. After that, the individual enters the lobby, walks to the elevator bank and travels to the 12th floor to verify where their proceeding will take place. A guardian, sponsor or other adult custodian typically accompany children, but kids often arrive on their own. For example, Benson says she met a seven-year-old boy whose mother feared being detained if she entered the courthouse and waited for her son at a coffee shop across the street. Once on the 12th floor, the individual finds their name, courtroom and the time their proceedings begin on one of several lists — at times including more than 50 names — posted on a large bulletin board. 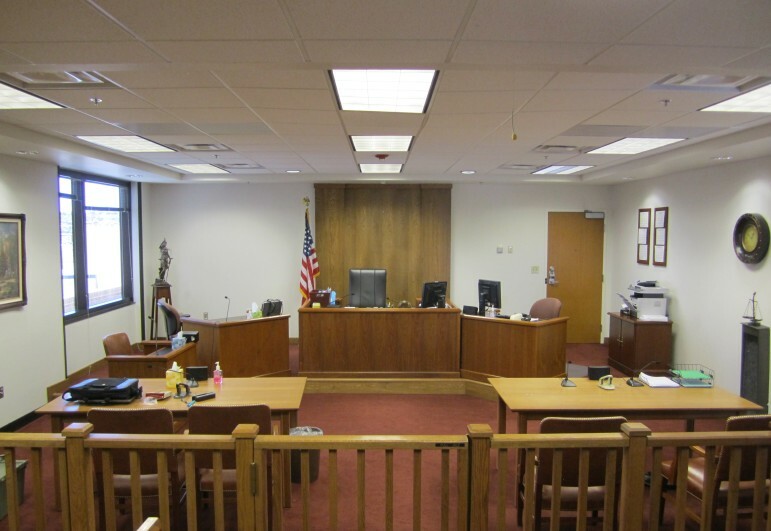 After locating the courtroom at which they will appear, the individual can sit in one of the drab waiting rooms on the 12th or 14th floor, where additional courtrooms are located, but only if they can find an open seat amid dozens of respondents, guardians, lawyers and translators. Court information is posted in English, which poses another challenge. On a recent day, one man wore a handwritten sign around his neck that said he did not speak English and needed assistance. The sign proved useful when someone offered to help him. Small courtrooms line the hallways on both floors and surround the waiting rooms. Security agents sit at desks or pace the hallways, pointing people to the bathrooms and demanding that people delete cell phone photos of the court. The guards have recently begun ushering pro bono attorneys out of the hallways when they try to meet with unrepresented children, Benson and Stotland say. Government attorneys drag metal carts filled with case files through the hallways while attorneys wait for clients to appear and defendants determine who will translate for them. The nonprofit teams maneuver through this environment searching for children who lack representation. When they find them, they conduct their consultations — often touching on sensitive information — in the open. The court’s decision to take away private space has also affected the attorneys’ ability to conduct “Know Your Rights” trainings and prepare children for court, says Ziesimer, who supervises the immigration project for Catholic Charities. She says her organization, which represents children in detention as well as non-detained, unaccompanied children, regularly brings up to 40 children to court. The changes inside New York City’s immigration court reflect problems in courthouses nationwide. Over the past few years, representation rates have fallen for children and courts have altered their juvenile dockets. As of August 2017, 88,069 children had cases pending in immigration courts nationwide, reports Syracuse’s TRAC based on EOIR records obtained through Freedom of Information Act requests. An immigration courtroom in Texas. According to TRAC, about three-quarters of unaccompanied minors who began proceedings in the 2017 fiscal year still lack representation. As in New York City, the rate of representation has decreased significantly in the past three years at the nation’s next four busiest immigration courts in Los Angeles, Houston, Arlington and Miami. Meanwhile, children and adults are appearing on the same court dockets before judges with little experience presiding over children’s cases, lawyers from Houston and Los Angeles say. For years, Doutre says, the dockets remained separate and proceedings generally occurred at specific times of the day. In Los Angeles, three judges continue to preside over most juvenile dockets, but there have been “a few outliers where unaccompanied children are mixed into adult dockets,” says Joanna Fluckey, Senior Direct Representation Attorney at the KIND office in Los Angeles. Fluckey says attorneys at the Los Angeles courthouse have not been permitted to use empty spaces to meet with unrepresented children and that the mixed dockets foster an even scarier experience for children. Like undocumented immigrant children in New York City, Fluckey says kids across the Los Angeles area have a tough time finding legal counsel and are left to figure out the chaotic system on their own. What is Life Like in Immigration Detention? Watch a lawyer, a woman who spent six months in immigration detention and a City Limits reporter discuss the court system that decides who gets to stay in the U.S. and who doesn’t. In hearings for those seeking asylum, claims of persecution must be evaluated by judges and ICE with little evidence to go on, and a byzantine system of laws to guide the way.